As a young attorney, Jeffrey Wertkin joined the Department of Justice where he investigated and litigated False Claims Act cases filed by whistleblowers. After six years fighting fraud for the government, working side by side with whistleblowers, Wertkin made the jump to the prestigious corporate law firm Akin Gump Strauss Hauer & Feld. If the story stopped here, this would be a typical example of a talented government attorney making a lucrative move to the private sector. Unfortunately, Wertkin had a plan to cash in with more than just a higher salary. He illicitly took files of sealed lawsuits brought by whistleblowers and attempted to sell whistleblower secrets from these False Claims Act suits to the companies being investigated. According to a Washington Post article, Wertkin was caught in Silicon Valley wearing a wig and a fake mustache trying to sell the whistleblower’s secrets to the company named as a defendant in a sealed case. Although Wertkin was caught in the act and stopped, his actions are still highly disturbing. Those who blow the whistle on fraud, waste, and abuse take incredible personal risks. It is shocking that a former government official, who used work with whistleblowers, could act in such a corrupt manner. 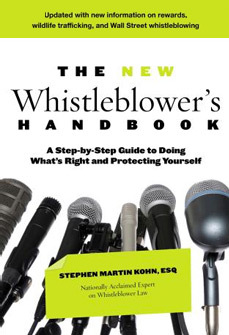 “The entire whistleblower community will be watching when Wertkin is sentenced in March,” said David Colapinto, National Whistleblower Center General Counsel and partner in the law firm of Kohn, Kohn & Colapinto. “Will Wertkin receive the same kind of punishment that whistleblowers accused of breaking the law have received, or will the government and the courts treat him leniently?” Colapinto asked. How many whistleblower secrets did Wertkin actually steal and try to sell? When did these crimes actually start and how many whistleblower cases did Wertkin access when he worked at DOJ? How was he allowed to return to his law office at Akin Gump in Washington, D.C. after he was arrested in California so he could destroy more evidence of his crimes? The DOJ must uncover and disclose the full scope of what Wertkin did, how he went undetected, and when he stole and potentially sold whistleblower secrets in files from sealed cases to prevent anything like this from happening again. A full accounting of what occurred is needed to restore confidence in the DOJ’s handling of whistleblower secrets and to encourage whistleblowers to report fraud. A stunning 92% of collections under the False Claims Act (or $3.4 billion of the $3.7 billion collected) in 2017 arose from whistleblower cases. The FCA will simply be incapable of deterring fraud if the DOJ cannot be trusted by whistleblowers to keep its cases safely under lock and key. Indeed, all forms of security are important for whistleblowers. While Wertkin’s corruption is an aberration, as DOJ attorneys assigned to False Claims Act whistleblower cases have proven themselves time and again to be trustworthy and honest civil servants, it takes just one bad apple to discourage whistleblowers from reporting fraud. Going to the feds should be the least of a whistleblower’s worries. Aaron Jordan is a Public Interest Law Fellow with the National Whistleblower Center. Before joining NWC, Mr. Jordan was a Dorot legal fellow with Alliance for Justice, where he worked on judicial nominations as well as health and financial regulatory issues. Unprofessional leadership cited in Air National Guard whistleblower case. Now those leaders are out.